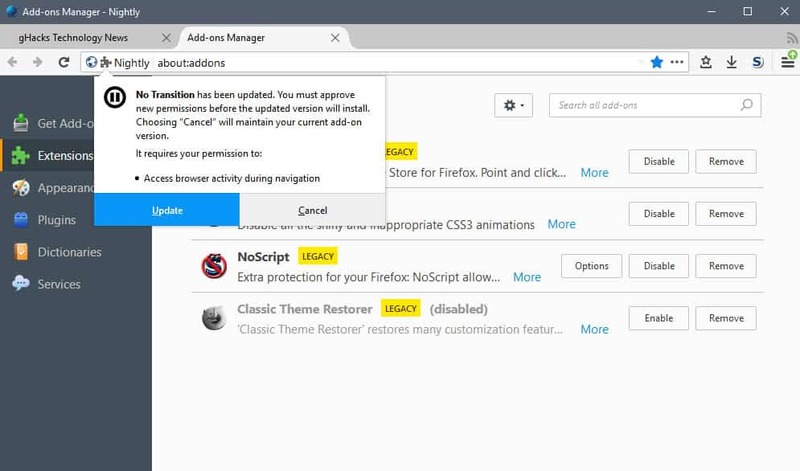 The move from legacy add-ons to WebExtensions introduces a permissions system that is similar to the one used by Google Chrome extensions. WebExtensions may request certain permissions. These are displayed to the user during installation, and are also listed on the add-ons page on the Mozilla website. Add-on authors may integrate new functionality and additional permissions in add-on updates. This is required for instance when the add-on uses new APIs that require extra permissions. Mozilla had to take permission changes — that is extra permissions requests that the add-on did not require before — into account when it designed the WebExtensions Permissions system. How should Firefox handle permission updates? Mozilla made the decision to put users in control. Extension updates run in the background usually without user interaction, but that is not the case when new permissions are requested. 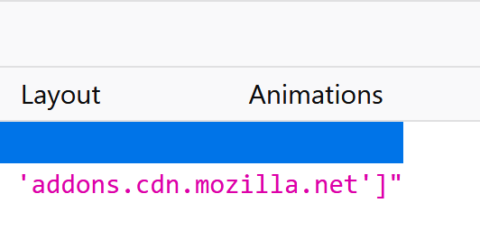 Firefox will download the extension just like any other, but it will prevent its automatic installation when it realizes that new permissions are required. This means that the old version of the add-on remains activated until you accept the new permissions. 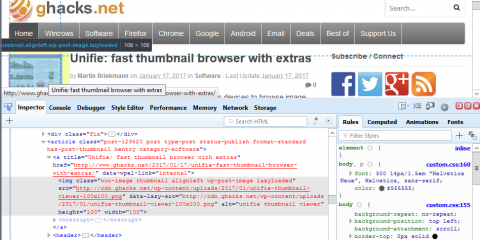 The web browser displays add-ons that require new extensions in the main Firefox menu. These are listed at the top of the menu currently. Note that this may change, as the system is not integrated in Firefox Stable currently. The message, highlighted in yellow, reads “Add-on Name requires new permissions”. 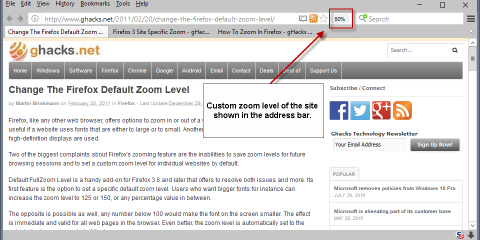 A click on the message opens the about:addons page of the Firefox web browser. This page displays a new notification that looks similar to the add-on installation dialogs of the web browser. The dialog lists the additional permissions that the extension requests, and why the dialog is displayed to the user in first place. “add-on name” has been updated. You must approve new permissions before the updated version will install. Choosing “cancel” will maintain your current add-on version. It requires your permission to.. The dialog presents two options to you. Update accepts the new permissions and installs the updated version of the extension in Firefox, cancel denies it. This means that the update won’t be installed. It is the case currently that you will receive continued requests to update, for instance in the Firefox menu. While you seem to be able to cancel those, there appears to be no option to block these notifications. The post Firefox’s new WebExtensions Permissions update system appeared first on gHacks Technology News.